Okay, so novice question. I was grocery shopping this evening and the gardening geek came out in me. I didn't really *need* another bag of onions, but i saw a hint of green inside the bag so I bought it. and... voila! 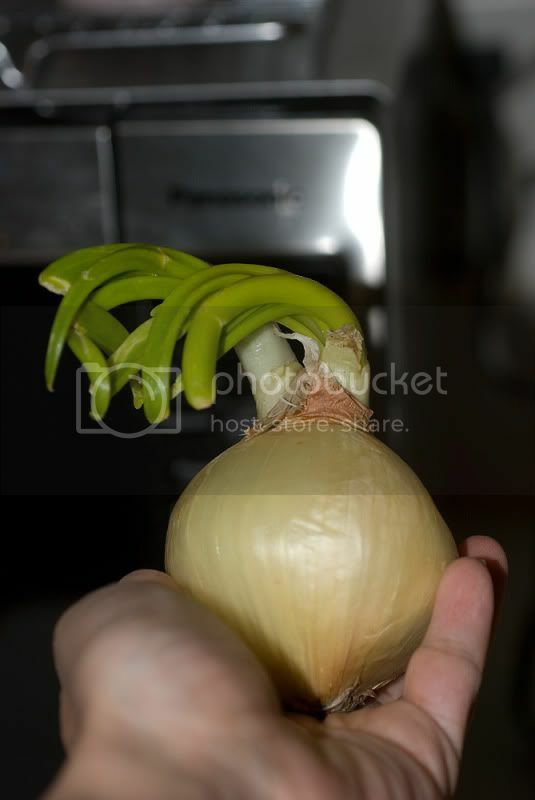 1- Can I plant it, and will it make an onion? 2-how do I prep it? 3- and I the only nutty person who would willingly get a sprouted vegetable for the purpose of planting it later? Yes, you can plant it. Yes, it will grow. Will it make another nice bulb? No. It will make some nice flowers though and later Seeds. You can collect the seeds for planting next year. No prep needed. Just plant it leaving the leaves above ground. jal_ut wrote: Yes, you can plant it. Yes, it will grow. Will it make another nice bulb? No. It will make some nice flowers though and later Seeds. You can collect the seeds for planting next year. No prep needed. Just plant it leaving the leaves above ground. awwww on no onion, but yay on seed! and flowers. I'll take it- thanks! I planted several just like that a month ago for the sole purpose of making seed. I should have said you can plant it and wait until it has made some nice new growth, then pull it and clean off all the old stuff, and eat the nice new green onion parts. Onions are biennial, so the second year they are bent on making seed. Sorry. 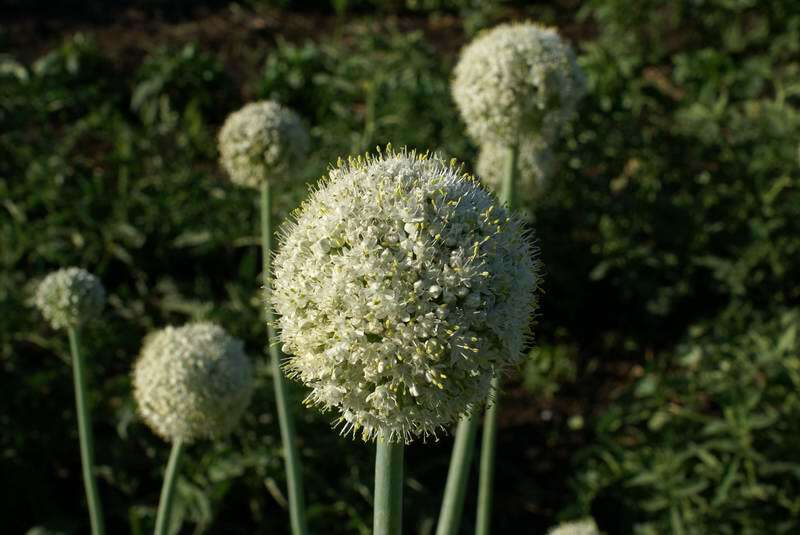 Here is an onion blooming. Don't be sorry. I'll take more seed, as I spent all of mine in a garden box this year. I just have terrible luck with growing onions and was hoping for at least ONE! SPierce wrote: I'll take more seed, as I spent all of mine in a garden box this year. I just have terrible luck with growing onions and was hoping for at least ONE! It's not at all too late to pick up a bag of onion sets and plant them. It only costs about a buck and a half. If you're out of room, just put them around the perimeter of your box. It will help a little keeping pests away and they only need about 3" of space (each). The bulbs will end up sized between a golf ball and a tennis ball, but plenty tasty. What is the best way to harvest the seeds? Watch those flower heads closely. When you see the flowers open up and the little black seeds appear, carefully pick the flower, bend the stalk over and put the flower in a paper bag, then clip the stem. Give it a shake. Leave it in the bag for a few days to dry. The seeds come out really easy. I have some green onions/scallions that flowered. I noticed that on each individual flower sometimes the black seed will be exposed cause the flower is open, when I see that I pinch off the little flower. I see others that show a little black seed but the flower is not really open all the way. Should I still pinch it off or wait till it opens a little? 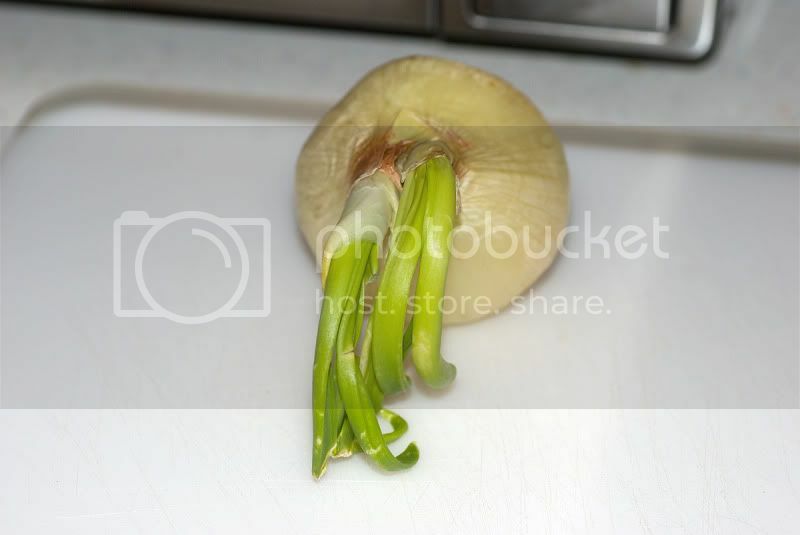 Most of my onions flowers are like this and I check daily. I am just worried about pinching some too early. I've tried saving seeds from onions for several seasons with very little success. I just got some to germinate in acceptable numbers for the first time. I remember that the second season I tried it, I assumed that I hadn't waited long enough for them to mature the first time, so I waited for them to dry out before collecting. That was another failure. Last fall, i waited until the leaves were dead, lying on the ground and completely dried out. More of them germinated this time, but the seeds that had spilled on the ground in the fall provided some robust volunteers. It made me think that the key is to sow them right away in the fall. Now, you guys have me wondering if it is best to collect the seeds right away when the flowers open? Onion seed should be sown in the very early spring. As soon as your soil is dry enough to get on, plant onion seed. I planted some seed I saved last year on the 13th of March this year, and it looks like every seed came. At least a good percentage germinated. I suppose it can be planted in the fall too, but I have not tried that. I wonder if the germination rate is affected as much or more by conditions at planting than seed collection times? I always collect it when it looks like it will fall out of the flower easily, and before it falls on the ground. orgoveg: "It's not at all too late to pick up a bag of onion sets and plant them. It only costs about a buck and a half. If you're out of room, just put them around the perimeter of your box. It will help a little keeping pests away and they only need about 3" of space (each). The bulbs will end up sized between a golf ball and a tennis ball, but plenty tasty." I second this. Plant some sets ASAP. jal_ut wrote: I wonder if the germination rate is affected as much or more by conditions at planting than seed collection times? I always collect it when it looks like it will fall out of the flower easily, and before it falls on the ground. Yeah, I should probably play around with some different sowing methods. It just bugs me that when I sow purchased seeds from a packet, they work just fine. That leads me to believe that the seeds are the problem. Who knows? Since I finally had some success, I should definitely repeat that process while reserving some seeds for experiments.